Ikko Fukuyama 2016 — Kami Ya Co.,Ltd. 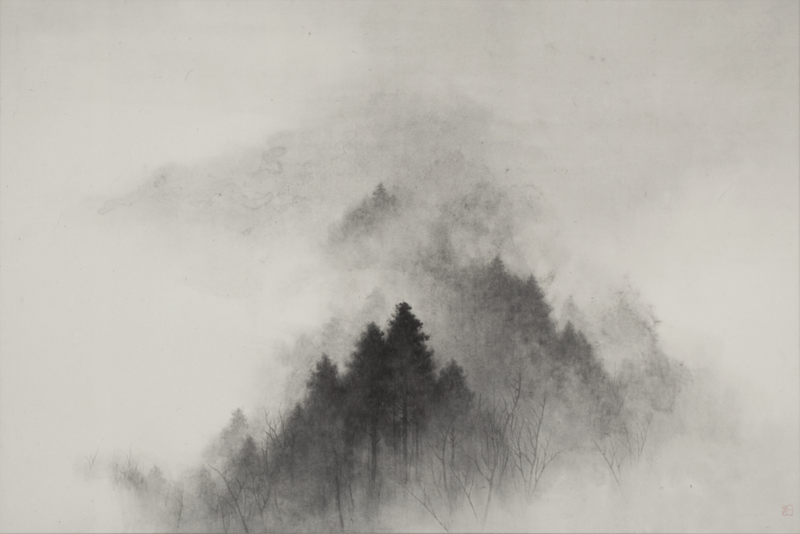 One day, several years ago, I encountered the paintings of Ikko Fukuyama.Scenes with trees were painted on two paintings small enough to fit in the palm of my hand. I was filled with a delight like having chanced upon a precious object from a treasure chest.Stillness hung over the small images that had been drawn carefully with a fine brush. Later, I heard that he was a Zen Buddhist monk who had trained in the Soto school of Zen Buddhism at Eihei-ji Temple, and was strangely satisfied. Many years have passed since that day.Fukuyama has shaved away all that is unessential over several years.He has repeatedly come up with ways to make his materials of paper and ink, as well as his technique, even more traditional and simple.Contemporary art is overflowing with new materials and techniques. However, like the great masters of the past, Fukuyama has entrusted the future of his expression to the skills he has honed, within the limitations of traditional materials. Fukuyama has just entered his forties--the start of the most productive and exciting period of an artist's career. I am greatly pleased to be able to present his latest work in Japan and Hong Kong as he embarks on his journey.